Your “lead score” is a numerical value that estimates how valuable a certain lead will be, based on pre-set criteria. From here, you can calculate your “average lead score”, telling you, on average, how promising and valuable the leads you’re bringing in are. If you can’t assess the potential of a new lead accurately, you could end up wasting time or resources on pursuing prospects that are unlikely to prove valuable. Calculating lead score helps you get smarter about which leads will - well, lead somewhere. Meanwhile, calculating the average lead score for your inbound marketing helps you figure out how valuable the customers coming from different channels are to your business. This means you can focus your efforts on developing the channels that earn you the best average lead scores (and sales), rather than simply pushing for the most traffic – which might turn out not to be profitable for you at all. To start with, you need to establish your criteria for a high scoring lead - the characteristics, demographics and other buyer behaviours that most often go hand-in-hand with a sale. Then, you can rapidly evaluate each new lead that comes in, according to how it stacks up against the criteria, and attach a lead score accordingly. Finally, you work out the average lead score, whether for your whole customer base or for a segment of it, by adding up the sum of all individual lead scores added over a set period of time and dividing by the number of days/weeks/months in that period. Provided the data you store on leads in your CRM is complete, you can use this as your major data source for attributing individual lead scores. In Sisense, you can manipulate your dashboard to reflect whichever sources of traffic you need to measure, whether that’s a specific marketing campaign, social media advertising, organic traffic or anything else. This means you can cross-reference the average lead score of your leads with where they came from, e.g. by connecting up web traffic data from Google Analytics or social media sites. Imagine your sales team had seen a dip in closed deals, despite having more prospects than ever in the sales cycle. 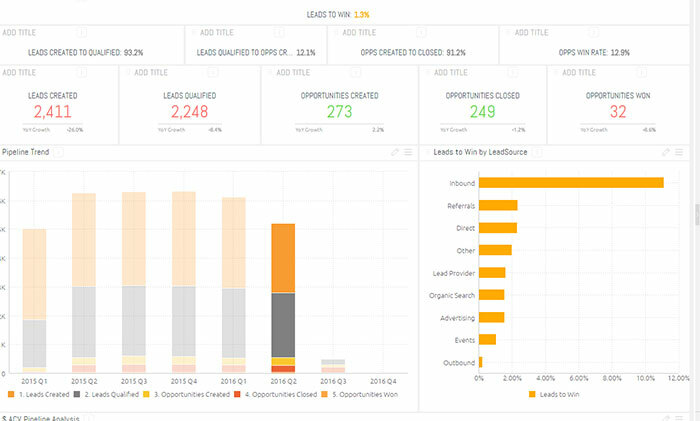 By automatically calculating lead scores for these prospects when they are first added to your CRM, you would be able to help sales prioritize which people to target, increasing their chances of closing profitable deals.